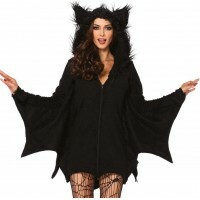 This fun cosplay Bat onesie costume is in cozy fleece - great fun for a scifi or anime convention! Cozy fleece zipper front onesie has attached bat wing sleeves and furry ear hood. Unisex. Other items shown sold separately. One size fits most adults - see size chart. Item Number: LA-c85552 | Approximate Size (Inches): 10.00 wide x 3.00 deep x 14.00 high | Approximate Shipping Weight: 2.00 lbs.